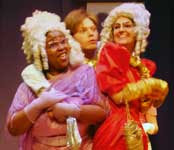 Cinderella Opens This Weekend at Hedgerow Theater ! Shows on Saturdays, Jan. 16- Feb. 27 at 11 a.m.
Cinderella meets her Prince thanks to help from a gardener in this charming musical version of the classic fairy tale. Hedgerow Children's Classics feature music and audience participation. Greet your favorite characters and enjoy juice and cookies in the lobby at the end of the show. Tickets are $9 for children and $11 for adults. Call 610-565-4211 for more information. Reservations are strongly recommended!